Against most wishes, Frank Jackson is refusing to open the dedicated bus lanes that run through the celebrated space. A fight over public transportation access on a roughly 0.1-mile stretch of road in downtown Cleveland is raising questions as to whether the city has a problem in the mayor’s office. Frank Jackson, now in the final year of his third term as Cleveland’s mayor, has refused to open the dedicated bus lanes on Superior Avenue that run through the city’s newly-redesigned Public Square. While Greater Cleveland Regional Transit Authority (GCRTA) buses were supposed to begin utilizing the lanes on Superior—which runs through the square on an east-west route—on August 1st, Jackson has worked to make sure that doesn’t happen. The opening of the lanes was first delayed, then the permanent closure was made official on November 15th. The decision was made unilaterally, and has prompted outcry and protests from city council, transit riders, and transit advocates. Public Square, among the most celebrated public spaces in northeast Ohio, underwent a 15-month, $50-million redesign and re-opened last June to great fanfare. A sea of concrete was turned into a grassy six-acre park, bisected by the bus lanes along Superior Avenue with the intent of creating a transit hub in the middle of the central business district. “The new Public Square moves us closer to a pedestrian, cycling, and public transportation friendly downtown,” Jackson said when the space reopened. Those remarks now seem disingenuous. Further complicating matters, the Federal Transit Administration (FTA) has demanded that GCRTA repay $12 million in federal funding due to breach of contract, and made known that funding for future projects may now be in jeopardy. The breach stems from a funding deal for the HealthLine bus rapid transit on Euclid Avenue that connects downtown to University Circle and the Cleveland Clinic some seven miles east. The line was to terminate at Public Square’s transit hub. The FTA letter specifically states that the closure of Superior Avenue is the cause of the breach, and GCRTA in turn sent a letter to the city’s law director advising that it would seek legal action forcing the city to repay the money. "The breach was triggered by the City of Cleveland's continued decision that the exclusive bus lanes on Superior Avenue through Public Square remain closed to GCRTA bus traffic," it read. GCRTA has since been granted an extension by the FTA until February 21st to repay the funds in full or file an official appeal. But had a unified square been the plan, the road and bus shelters would never have been built. After millions of dollars and man-hours spent on the design review process and reconstruction of Public Square, it is clear that the space was meant to accommodate transit. Rerouting buses around the square requires a steep increase in potentially dangerous left-hand turns—as many as a million per year. This argument that pedestrians on the square would be imperiled by bus traffic, or that the space could be vulnerable to a vehicular terrorist attack similar to that seen in Berlin or Nice, is also tenuous. 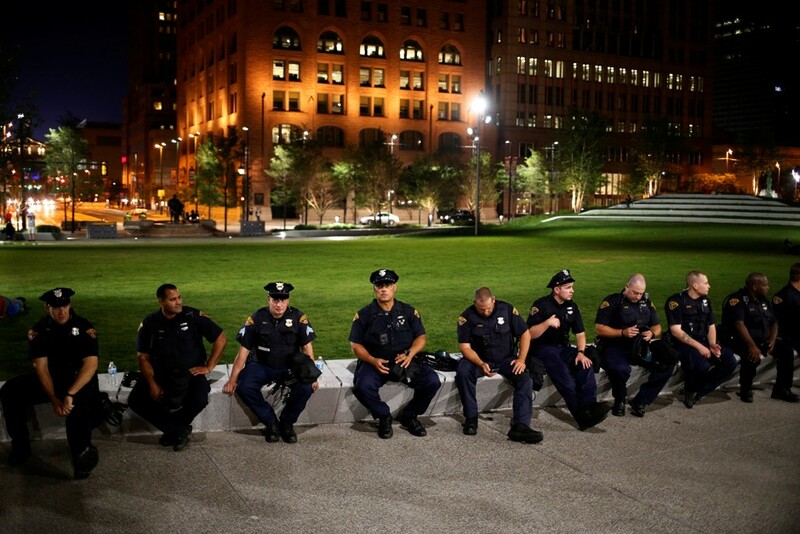 No evidence that Public Square is of greater risk of attack than other sites in the city has been found, and the city does not have a risk mitigation plan in place. As for public safety, rerouting buses around the square requires a steep increase in potentially dangerous left-hand turns—as many as a million per year, according to Clevelanders for Public Transit. A 69-year-old woman struck while legally crossing the street by a bus making a left turn along the perimeter of the square on December 7th passed away due to her injuries. A GCRTA investigation into the incident found that the collision was preventable. And still, Jackson, who announced earlier this week that he’ll seek a fourth term in November, refuses to relent. The simple solution for Jackson would be to open the bus lanes, avoid the FTA penalties, and ease the tensions with transit riders and city council. Failing that, it seems it will be the voters of Cleveland—those who feel the mayor has turned his back on their interests—who will have the simple solution. Benno Martens is a freelance writer and urban planner based in Cleveland.